With Verizon's new webOS handsets now out the door, Palm has updated its online store with some new details on where to purchase the new devices. A surprising new option has materialized which gives shoppers the opportunity to buy a new Palm Pre or Pixi (plusses included) directly from Palm.com without a contract commitment or carrier credit check. The standard Sprint Palm Pre and Pixi sell for $549 and $399, while the Pre Plus sells for $599. While this is a nice option for developers and customers, prospective purchasers must still pay the full unsubsidized price, and the CDMA devices seem to still be locked to their respective carriers. As of today, there is still no domestic unlocked option or a US GSM model offered at this time. Developers and users not interested in a CDMA contract commitment can utilize various third party developer tools to customize and bypass the usual activation processes. webOS Internals has a program called MetaDoctor which does just that. The program provides a means to bypass the "First Use" application and allows a webOS phone to function without having been activated on a cellular network. 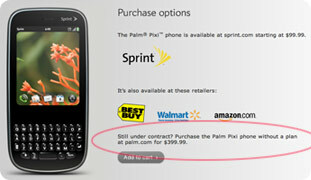 In addition to the direct purchasing options, Palm now also lists some online retailers that offer webOS phones. Currently the options detailed include links to Amazon.com depending on the model. Having heard the wails of WebOS hopeful owners and potential developers all over the world, I am all too familar with that situation. Heck, I even went out of my way to buy a Sprint Pre here and sent it overseas for a friend to hack & test out in wi-fi mode since there were no GSM Pre to be had for so long in '09. A WebOS NON PHONE DEVICE (aka "Pre Touch" aka a PDA) would handily solve that problem but we all know that makes too much for sense and Palm absolutely cannot release such a beast. To put it simply, Palm management doesn't CARE enough to really get out and make a concentrated effort. "Just good enough" is perfectly sufficient for them. That's been the MO ever since they were unable to follow up the smashing success of the Palm V with a line of continuously improving devices. Back to the present: if they bag a big Sprint deal, smaller AT&T and Verizon deal, and a handful of European carriers, that's good enough to keep the coders employed and the lights on while they look for a new suitor to give Elevation Partners a handsome ROI. Look how the s**t storm of Fooleo criticism (plus Engadget's open letter) shook things up a few years ago. The best way to keep Palm moving forward is to call them out frequently and publicly. But it doesn't matter WHO is at the helm of that company. The same sense of arrogance pervades Palm now just as it did in the Yankowski era. Wow, they really ruffled your feathers Kris! I agree 95%, except for "The worst thing that ever happened to Palm (Palm & PalmSource spin-off aside) is that they decided to become a cellphone company"
I know, the Foleo was Hawkins, but it was never given a chance. Had it hit the market, by now it would probably have all the coolest state of the art goodies and be selling like gangbusters! Naw Gary, they didn't ruffle my feathers personally or with any one particular move. I just see so much of the phenomenal early Palm OS had being lost in the in '98-'00 timeframe, so many missed opportunities to establish Palm OS as THE mobile OS in the early-mid '00s (when the licensees such as Handera, Handspring & Sony were pushing Palm to improve), and then the lead they squandered with the Treo 600 from Handspring. Compare the Treo 600 of 2003 to the Centro of 2007. That's an eternity in the smartphone biz yet Palm made only the minimum improvements to their platform(s). And now I see so much potential in WebOS and it's being symied by slow rollouts, silly carrier exclusivities, poor developer support, no developer handset or non-phone device etc. But yeah you do bring up a good point about Hawkins no longer being on board. And with Hawkins went Rob Haitani, the tap counter, Graffiti 1 etc. Although I must admit, as novel as the Springboard concept was in its time, it would not fare well at all in today's environment. First of all, you have the carriers who would oppose it mightily. Secondly, the FCC would probably not like such a beast. Finally, from an engineering standpoint (of which you are vastly more familar than I), things have become so miniaturized and with multi-core and/or integrated GPU/CPU chipsets nowadays that you basically need a clean sheet design for each new handset/formfactor. "Although I must admit, as novel as the Springboard concept was in its time, it would not fare well at all in today's environment. First of all, you have the carriers who would oppose it mightily. Secondly, the FCC would probably not like such a beast." Maybe, but think how low cost it would be for the carriers if Palm were offering them a device that that only contained the radio & enough smarts to prevent the controller from going outside the FCC licensing and could be attached to any Palm PDA. I also think the Springboard could have evolved, keeping hardware and software developer support. What r u talking @ Khris? The "springboard" concept was beautiful. Carriers could have sold it just like they do USB dongles, mifis, and did PCMCIA cards. It's so "right up you're alley" ... you get to have your PDA and IF you want, you can make it network capable. Or NOT! The springboard concept was really amazing at the time. However, they had no control on what kind of modules were produced. The vast majority of them were pointless, but there were a few innovative ones made. I switched to a Visor back then because I saw the potential. A lot of devs saw the potential and heard JH's promotion of it, right up until the time he abandoned it. I keep hearing that more than a few are still bitter about that episode. It was definitely a Lane Kiffin moment for him.